I'm finally getting out of my drawing funk. I'm still scanning and photographing my new work, so it will be up on this blog in the next week or two. 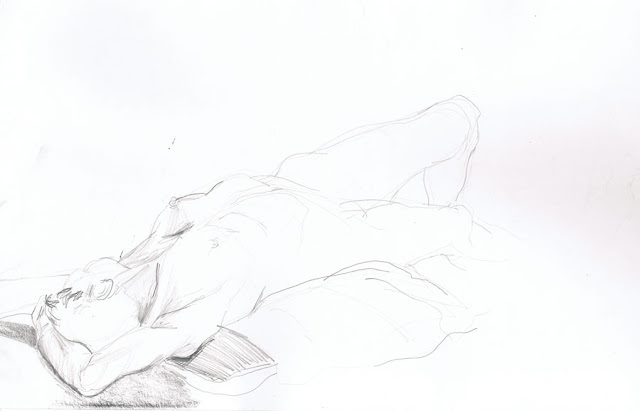 For now, here is some figure drawing I did at the Mission Cultural Center and at UC Berkeley. Unfortunately, the time I was at Berkeley, I didn't get a very good seat, and had a poor, backlit view of the model. Plus, I was doing line drawings in light pencil, which don't scan very well. So most of these scans are from the Mission. There is an elegant and poetic simplicity to these drawings. Very nice.